Definition at line 110 of file llvfs.cpp. Definition at line 113 of file llvfs.cpp. Definition at line 118 of file llvfs.cpp. Definition at line 186 of file llvfs.cpp. References mAccessTime, LLUUID::mData, LLVFSFileSpecifier::mFileID, LLVFSFileSpecifier::mFileType, mIndexLocation, LLVFSBlock::mLength, LLVFSBlock::mLocation, mSize, and swizzleCopy(). Referenced by LLVFS::audit(), and LLVFS::LLVFS(). Definition at line 124 of file llvfs.cpp. References i, mAccessTime, mIndexLocation, mLocks, mSize, NULL, S32, and VFSLOCK_COUNT. Definition at line 205 of file llvfs.cpp. Definition at line 170 of file llvfs.cpp. References mAccessTime, LLUUID::mData, LLVFSFileSpecifier::mFileID, LLVFSFileSpecifier::mFileType, LLVFSBlock::mLength, LLVFSBlock::mLocation, mSize, and swizzleCopy(). Definition at line 146 of file llvfs.cpp. Definition at line 141 of file llvfs.cpp. Definition at line 151 of file llvfs.cpp. Definition at line 216 of file llvfs.cpp. Referenced by LLVFS::audit(), deserialize(), LLVFS::getExists(), LLVFS::incLock(), init(), insertLRU(), serialize(), and LLVFS::setMaxSize(). Definition at line 215 of file llvfs.cpp. 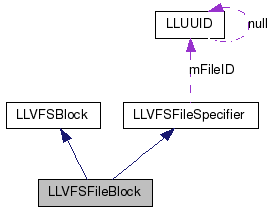 Referenced by LLVFS::audit(), deserialize(), init(), LLVFS::LLVFS(), LLVFS::removeFileBlock(), and LLVFS::sync(). Definition at line 217 of file llvfs.cpp. Referenced by LLVFS::incLock(), and init(). Definition at line 214 of file llvfs.cpp. Referenced by LLVFS::audit(), deserialize(), init(), LLVFS::LLVFS(), LLVFS::removeFileBlock(), serialize(), and LLVFS::setMaxSize(). Definition at line 219 of file llvfs.cpp. Referenced by LLVFS::audit(), LLVFS::LLVFS(), and LLVFS::sync().